Congratulations to our first ever FAN FEATURE Winner, Richard Ely. Below you will find a guest post where he summarizes the book The Oldest Living Graduate: A Story of Love, Luck and Longevity by LTG William J. Ely, USA (Ret), Live Member. Lulu Publishing. Richard has also generously provided with 3 copies of the book to give away. After reading his summary, use the Rafflecopter widget at the end of this post to enter. 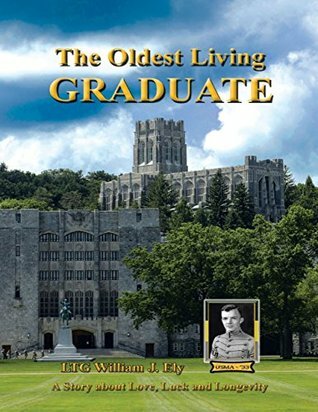 The Oldest Living Graduate is the auto biography of William J. Ely. He was raised on a modest farm in Pennsylvania, graduated from the United States Military Academy in 1933, served with the Corps of Engineers in the South Pacific during WWII and retired as a highly decorated lieutenant general in 1966. Subsequent to his service in the Army he became the senior vice president of Sverdrup and Parcel overseeing operation and construction around the world. He is also a published writer, and entrepreneur, a philanthropist and an extraordinary bridge and golf player. He fell in love and married his wife Helen on a short break from Midway Island in 1940. They lived the American Dream together for more than 74 years before she died at the age of one hundred. Next to his wife Helen, his greatest passion was the game of golf. He was a highly acclaimed amateur golfer who won multiple championships, shot his age more that 2000 times and was inducted into the Quail Ridge Hall of Fame with such notables as Sam Snead and Claude Harmon. The Oldest Living Graduate reaches its end with a summary of the author's "lessons learned" from more that a century of living and a personal status report of his daily life. The General is still active in Delray Beach, Florida at nearly 104 years of age. For more information about this title, visit the publisher's website, Amazon, and Barnes and Noble. If this sounds like a book that might appeal to you, please enter for a chance to win one of three copies of it. Open to US residents only. This entry was posted on Saturday, November 14, 2015 and is filed under American History,Book Giveaway,Fan Feature,Giveaway,LTG William J. Ely,Memoir,Richard Ely,The Oldest Living Graduate,War. You can follow any responses to this entry through the RSS 2.0. You can leave a response. This sounds like a very true story which we lead us through understanding someone's who life. I like the sound of it all coming together to teach us some life lessons that the main character has gradually learned throughout their own lifetime as well. Thanks for stopping by the blog. I'll notify you if you win a copy!